Owners of all Fujifilm Frontier™ Digital Minilabs can now take advantage of the latest CPAC ‘Universal’ type cartridge suitable for ‘EVERY’ Frontier Minilab on the Market today. This Premium Quality Product offers significant Cost Savings over existing chemistry, whilst not compromising at all on Quality. In fact CPAC Chemistry is noted for its higher D-Max & Excellent Optical Brighteners & Bleach/ Fix/ Stabilisers giving superior Print Base Whiteness & Negating Silver Retention, as Independent Lab Check results attest, therefore giving superior Digital Printing results. 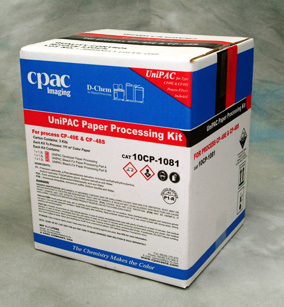 CPAC ColourPAC Universal Formulas are exceptionally clean running and maintain Premium CPAC performance through all processing stages. CPAC's New & Innovative D-Chem™ Digital Formulations produce the Deep Blacks, Pure Whites & the Brighter Colours needed to enhance Premium Digital Prints.